This advice appears every heating and cooling season: switch to a programmable thermostat and you can save big bucks off the heating/cooling portion of your energy bill! Everyone knows that programmable thermostats save you money, right? Well, as it turns out, programmable thermostats aren’t the money-saving machines we’ve been lead to believe. Actual savings are much less than advertised – in fact, it’s not unusual for consumers to use more energy with a programmable thermostat. How can that be? 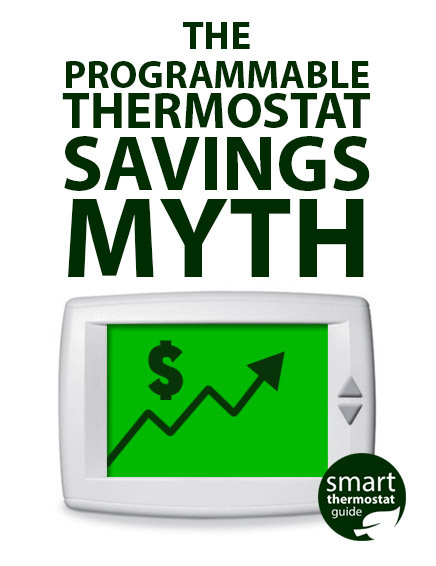 Let’s explore the programmable thermostat savings myth – and whether it applies to smart thermostats. Studies from the 1970s the time suggested that a daily 8-hour reduction in temperature during sleeping hours could bring a 1% reduction in natural gas consumption for each Fahrenheit degree, and in 1995 the EPA started promoting programmable thermostats as a way to save anywhere from 10 to 30% off a home’s heating and cooling bill. However, by 2006 it was becoming evident that programmable thermostats weren’t delivering on this promise. The actual savings was found to be closer to 6.2% by a 2007 Gas Networks study . 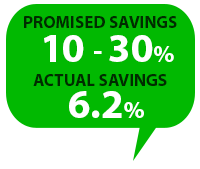 So where did that 10-30% promise come from, anyway? First of all, it’s from the 1970s – before improvements in insulation and construction in homes built in more recent decades. Second, it assumes your previous habit was to leave the thermostat set to 72 °F (22 °C) degrees day in, day out. Third, it assumed people would be more meticulous about programming their thermostats and choose energy efficient settings. According to a Florida study, only 3.4% of homes actually used the ENERGY STAR recommended cooling program. Realizing the failure of programmable thermostats to deliver on their promise, the EPA stopped awarding Energy Star badge to programmable thermostats and started promoting energy saving behaviors instead, such as dropping the temperature while residents are sleeping or out of the house. Smart thermostats automate energy saving behaviors, like lowering the temperature during the workday, which in turn helps deliver on that 10-30% savings promise. One easily-overlooked factor when calculating savings is the outside temperature. If you’re in the middle of a harsh winter, the savings seen from lowering the temperature on your thermostat a few degrees are much larger than the savings you’d get in a milder climate. In the harsh climate, the heating system must work much harder for each degree of warmth. If it’s 10 °F (-12 °C) outside, your furnace is working hard to get your home to 68 °F (20 °C). That’s a difference of 58 (or 32) degrees! In a mild climate where the outdoor temperature is, say, 40 °F (4 °C), the furnace doesn’t work so hard to raise the inside temperature to 68 (20 °C). That difference is just 28 (or 16) degrees. This is why lowering the thermostat by 10 degrees Fahrenheit (5 if you’re using Celcius) is so much more effective in, say, Chicago, than it is in a temperate climate like Seattle. Some smart thermostats, such as the Nest Learning Thermostat (read our Nest review) and the ecobee (read our ecobee review), compare your usage to others in your state. While you can’t control the climate, you can see where you rank in comparison to your neighbors. If you discover that you’re lagging behind the pack, you might get inspired to change your habits and improve your home’s energy efficiency. 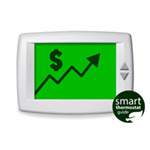 Many programmable thermostats feature complicated interfaces navigated by just a few buttons and a small display. 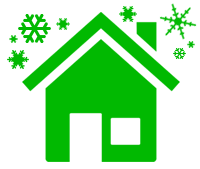 Commonly cited usability problems include small text size, confusing abbreviations (“Clk” for “clock), terminology (“set point”, “zone”), hard-to-see screens, and lack of programming feedback. Technology has improved the capabilities of programmable thermostats, yet little progress has been made in terms of usability. Frankly, most people are afraid to touch their programmable thermostat. According to “How People Actually Use Thermostats”, 89% of survey respondents reported that they rarely or never adjusted the thermostat to set a weekend or weekday program. 54% of respondents report using the on/off within the last week, suggesting that many users treat programmable thermostats like manual thermostats. The smart thermostat business is built on addressing usability problems with old fashioned programmable thermostats. Thermostats worthy of the “smart thermostat” name feature intuitively laid-out touch screens and web/app interfaces that follow modern design conventions. By focusing on usability, smart thermostats have reduced the worst frustration associated with programmable thermostats. 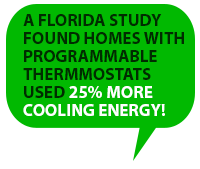 Here’s an interesting nugget: an ENERGY STAR study that included 400 Florida homes found that homes with programmable thermostats had 25% higher demand on cooling, accompanied by a 24% increase in annual cooling energy consumption. Whoa! Users with programmable thermostats used more energy than those without! What’s behind this? Remember also that most programmable thermostat owners rely on the “hold” feature instead of any programming, and those who do program might have chosen temperatures and never come back to adjust inefficient choices. Given the poor user feedback on programmable thermostats, the typical user probably isn’t even aware of what temperatures constitute efficient choices. There may also be a bit of an “entitlement” effect – saving energy during the day means getting to be extra comfortable in the evening, right? Smart thermostats, including the Nest Learning Thermostat, push users towards energy-efficient temperatures and reward energy-efficient choices. One final factor? Good old fashioned motivation! If you’re motivated to reduce your heating and cooling bill, you’ll find ways to do it regardless of your thermostat’s design. If you’re not, you’ll just let it run at whatever temperature keeps you comfortable. Smart thermostats are particularly good for those who fall into the second group – by automating the increases and reductions in temperature, a smart thermostat can take over the tedium and guesswork to deliver effortless energy savings. Read more the advantages of smart thermostats here. But, even if you’re already meticulous about managing your programmable thermostat, you will probably enjoy the additions to your thermostat’s toolbox such as monthly energy reports, comparisons with neighbors in your region, and remote access. Links to the fascinating research reports that provided the data used in this article about programmable thermostat usage. A couple bloggers’ takes on the programmable thermostat savings myth. Just got a Nest for Christmas. Went out for the night on New Years Eve and had the nest go down to 60 while out of the house. We were gone for around 7 hours and forgot to turn the Nest on before we got home. It was very cold in the house when we got home and when we set it to go to 70, it said that it would take 2+ hours to get back up to 70. Now isn’t it worse for your furnace to run for 2+ hours consistently to get back up to that temp than it is for it to run just a little bit here and there to maintain it? I was thinking it wouldn’t be worth it to turn it that far down for just a night (or in our case a few hours) but maybe for a couple nights it would be? Just seems like more energy might be used/required to get it back up so soon than to keep it up. If that makes sense. 1) Running consistently is easier on the furnace than cyclic usage because thermal and stress cycling is difficult on materials and the parts they are made of. The point is this, If for half of the day, you decrease the temperature difference by half, half the heat will be lost because the equation is linear. Less heat loss means less fuel is used and money is saved. Is that actually true? Let’s consider two simplistic scenarios. Scenario A is 0F outside, the Scenario B is 30F outside. In both cases, the temperature choices are 60F and 70F. The heat that escapes through the insulation is directly proportional to the temperature difference. Therefore heat loss in Scenario A is (70-0)X or (60-0)X, where X reflects the rate of heat loss for 1F difference. The difference in heat loss in Scenario A is therefore (70-0)X-(60-0)X = 10X. Fast forward through Scenario B and you get (70-30)X-(60-30X) = 10X. In this simplified analysis, there is no difference. In fact, in the warmer scenario, the setback would be more valuable as a portion of heating costs. But the absolute value would be the same. During the heating season, the unventilated spaces (wall cavities, space between floor joists, etc.) become cold due to the setback and never fully warm up during occupied times. Their average temperature will always remain below the desired occupancy temperature. This causes cool down-drafts adjacent to the walls and the sensation of cold floors as well as a lake of cold air just above the floor. Most folks will respond to this by setting the occupied temperature higher. Few and especially those with very young children on the floors will tolerate this and eventually figure out that a costly smart thermostat may save chump-change but at the cost of significant discomfort. Personally, I feel it is worth the inconsequential cost just to be comfortable in my home. After all, that is why I pay for heating and cooling in the first place. I didn’t by my $10,000.00 HVAC system to save money, I bought it to keep my family comfortable! Best comment by Gord. I have a 4000 ft2 home. I heat the whole thing including the full basement. I spent a lot of money on insulation, good windows, proper home design/orientation, and an efficient properly sized heating system so that my home would be comfortable in the winter without excessive gas bills. If I wanted to save energy, I would have built a smaller house! More importantly, the inside temperature of the home is not a constant. Doing more active things requires an inside temperature that would probably be too cold if only sitting and watching TV. Also bedtimes at my house are varied- my wife is usually in bed by 9 and she gets up at 3:30 for work. I am up until about 12;30 and get up at 6:30. That leaves less than 3 hours for sleep time setback which makes meaningful setback impossible. We save energy other ways.